A&M's football stadium, Kyle Field, has long doubled as one of the region's biggest bat habitats — or at least it did until recent renovations began. Now, the bats have spread across the rest of campus, showing up in swimming pools, offices and other campus buildings. COLLEGE STATION – The natatorium at Texas A&M University is typically a hub of activity in the spring. Students swim laps there, health classes use it for instruction and the swimming and diving team practices on its high-dives. But this month, all that activity stopped because of a new user. For about a week, hundreds of Mexican free-tailed bats made the pool their temporary home. The infestation was an extreme case, but it wasn’t altogether unique. 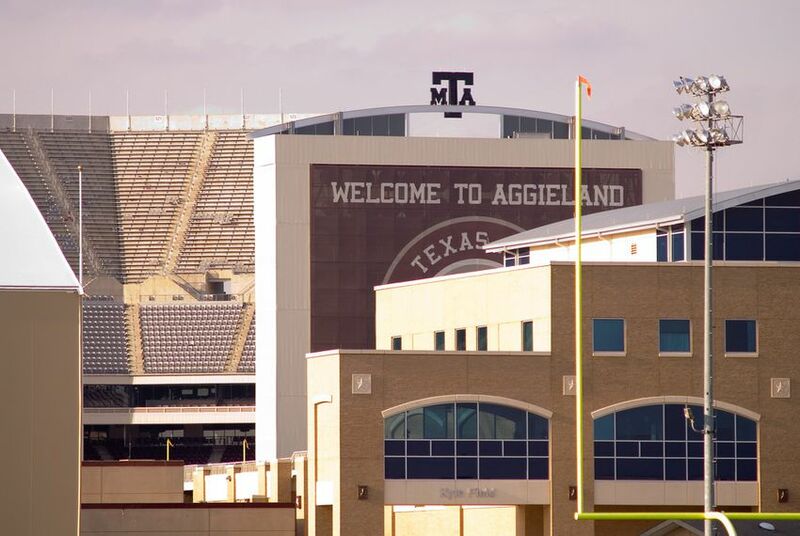 Renovations and eradication efforts at the bats’ normal home – the football stadium Kyle Field – have forced the flying mammals out across the rest of campus in search of new shelter. “They are finding bats in the gym, in the swimming pool – all kinds of places,” said Thomas Lacher, a wildlife and fisheries sciences professor and bat expert on campus. Bats have always had a presence at the university. Several thousand live in Kyle Field year-round. And during certain times of year, when the migratory animals are passing through the surrounding Brazos Valley, there are hundreds of thousands. The same thing happens at other large concrete structures across the state, most famously at the Ann W. Richards Congress Avenue Bridge in Austin. Occasionally, the animals come into contact with humans – like the time in 2000 when one bit a barefoot student in the A&M library after it flew into her shoe – but they’re mostly harmless. Despite stereotypes, very few carry rabies, and they usually fly high enough to avoid humans, Lacher said. For years, university officials mostly just left the animals alone. They hung signs in the stadium warning fans that they were entering a “bat-friendly stadium.” And any stray dead bats were scooped up before games. But there were reasons to get rid of the animals. Fans in the fall had to endure the pungent smell of guano during football games. The bat poop stained the walls and covered the ground. And there were health concerns, considering food is prepared and served in the stadium. “They were defecating on the concession stands,” Lacher said. Removal efforts began in 2013, when the university hired a local pest control company to hang nets in some concourses. That allowed the bats to get outside the stadium to feed, but then prevented them from getting back in. Other areas of the stadium were demolished to make room for gleaming new amenities. Soon, large groups of bats began appearing elsewhere on campus. More than 1,000 showed up in nearby Cain Hall, which houses the student counseling department. An employee told The Bryan-College Station Eagle that she found several of the animals dead in her closet. But their arrival at the natatorium this month may have been the most disruptive. The bats were swarming and feeding and fighting inside, said James Nash, associate director of facilities at the A&M Recreation Center, where the pool is housed. The university brought in two different pest control companies to get rid of the bats. Eventually, they used the same method used at Kyle Field, hanging nets in the areas where the animals had been entering. The bats' presence led to some curiosity and joking among students and staff. But Lacher said the situation is far from funny. The homeless animals’ lives are at risk, he said. At night, bats’ body temperatures drop significantly, he said. That allows the animals to rest, but it also puts them at risk when the temperature drops. The animals need shelter or they will die. And right now, there is no place big enough on campus to house them all, Lacher said. When the renovations began, some of Lacher’s students studied the issue and made recommendations to the school. They suggested following the example of the University of Florida, which had a similarly large bat population living inside its stadium. When that school forced its bats out its stadium, it built a group of large outdoor bat houses elsewhere on campus. The structures in Florida looked like the roofs of old houses, only without a building underneath. Eventually, thousands of bats moved in, and the houses became popular local attractions, Lacher said. Saving the animals in College Station would benefit the surrounding area, Lacher said. The bats spread out across the region to eat insects at night, which benefits the local agriculture industry, he said. “It would be a great gesture for the university to make, being one of the leading agricultural universities in the country,” Lacher said. A&M administrators didn’t answer questions this week about their efforts to deal with the bats. Lacher said the university built a few small houses around campus, but they are nowhere near big enough to take in all the animals. As a result, the future of the bat colony doesn’t look good, he said.